Peel and core apples. In a 1-quart saucepan, combine apples, fruit preserver powder (or lemon juice), Splenda, and water. Bring the liquid to a boil over medium heat. Turn down heat to simmer and cook, covered for 20 minutes, stirring occasionally. Remove lid and continue cooking until most of the liquid has evaporated, about 5–10 more minutes. Remove from heat and allow to cool slightly. Carefully pour hot mixture into food processor and pulse until desired consistency is achieved. 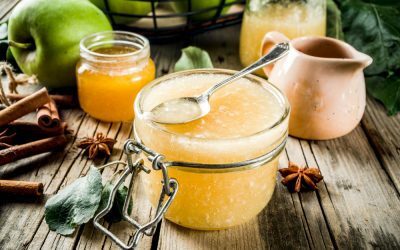 Serve the applesauce warm or cold, sprinkled with half a teaspoon cinnamon per serving. Exchanges per serving: 2 fruit. Carbohydrate choices: 2.